1974 Simplicity Pattern #6620 Unlined Jacket & Pants Sz 16 Uncut FREE SHIPPING! 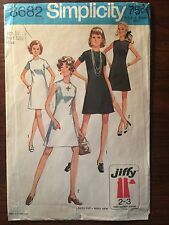 Uncut 1974 Simplicity Pattern #6620 - Size 16 / Bust 38" / Miss. Unlined Jacket and Pants: The top-stitched unlined jacket with front button or snap closing has front seam interest, front and back yokes, lower band, notched collar and long set-in sleeves gathered to sleeve bands. Pattern #: 1817. Item: Dress Pattern. The pattern is a misses size 10, bust size 32 1/2 and a. This pattern is new has not been cut and the pieces are. factory folded. The pattern envelope shows light signs. Envelope shows wear but pattern is uncut and factory folded. Misses' Fitted Two-piece Dress: Skirts gathered to waistband have front button closing. Skirt V. 1, 2 and underskirt V. 4 have lower flounce. Vintage 1940s McCall's #5110 Girl's Blouse Pattern Size 8, Bust 26"
You will receive a 1943 McCall's girl's blouse pattern #5110. Size 8, breast 26". The pattern pieces are in good enough condition to be traced, and not all have tears. The pattern is MISSING the collar for views A & C, and the sleeve facing. Simplicity 7287. Misses Sizes 12 14 16. 10 Pieces, Uncut & Factory Folded. Easy-to-Sew Pull-on Skirt & Pants in Two Lengths & Shorts. All have side seam pockets and four rows of elastic in waistline casings. Vintage 1970's Simplicity #7066 Boy's Robe Pattern Size 10/12, Chest 28/30"
The envelope reads "Boy's robe in two lengths (Transfer for Embroidery Included): Top stitched robe with shawl collar and front-wrap closing has patch pockets, long set-in sleeves with turn back cuffs and self tie belt slipped thru carriers. Vintage 1970's Simplicity #8682 Women's Pattern Size 10, Bust 32.5"
Size 12, chest 34". 1 and 2 with low round neckline has back zipper and short set-in sleeves. Long dress V. 2 has sequin or lace trim.". The pattern has been checked, and is complete. 1975 Simplicity Pattern #7051 Sz 16 Bust 38" Western Shirt FREE SHIPPING! 1975 Simplicity Pattern #7051 Size 16 Bust 38" Western Shirt - Pattern has been cut and envelope shows wear. All pieces, instructions and transfers for embroidery verified as present. The top-stitched shirt with optional embroidered front and back yokes has front band button or snap closing, shirt type collar, shaped lower edge and long set-in sleeves, pleated to buttoned or snap fastened cuffs. Blouse with front button closure, sleeveless top has back zipper. The pants and skirt have back zipper and elastic waistline casing. Condition: Pre-owned, uncut, factory fold pattern in good condition. All pieces and instructions have been verified as present. Ankle-length, sleeve-less and collarless. 11 Pieces Uncut Factory Folded. There are two sleeve length options to choose from. Misses Short/Long Sleeve Dress. These patterns were ordered in the size needed. The instructions say to not trim the pattern pieces prior to cutting the fabric. Skirt has back zipper and side seam pockets. Blouse is front button, short sleeve, and has optional welt trim. Top-stitched, lined jacket has front button closing, ockets and long sleeves with button trim. 1968 McCalls Pattern #9507 Size 16 Bust 38 Blouse in 3 Versions FREE SHIPPING! 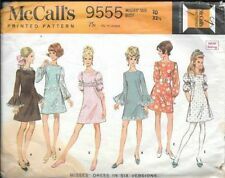 1968 McCall's Pattern #9507 Size 16 Bust 38". Pattern has been cut and envelope shows wear. All pieces and instructions have been verified as present. Front buttoned blouses have long set-in sleeves and a choice of three necklines. Very Easy Vogue 9201. 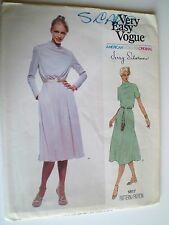 This Very Easy Vogue pattern is for a loose-fitting, unlined, straight coat or jacket with dropped shoulders, shoulder pads, pocket and top-stitched hems. The skirt and cuffed pants have front pleats and side pockets. Sleeve and collar variations. Condition: Pre-owned, cut pattern in good condition. Envelope good; no flap. Bust: 32.5". Waist: 25. Design your own pants, skirt, dress or tunic.8 great looks. A 'Karen Z' Design Pattern. NOTE: Pattern shows 'Size 6-12, however, it has been cut on Size 10; therefore Size 12 is unavailable. Envelope good. Pullover top has scoop neckline, side slits, and long or short sleeves. Lined vest, in two lengths, can be made with self-ties, button or toggle closure. Condition: Pre-owned, uncut, factory fold pattern in good condition. Simplicity 9833. Dress and Top have funnel neck, front slash opening, raglan sleeves and optional tie belt. 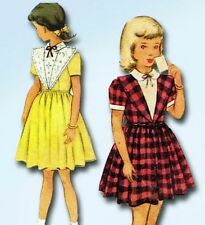 Other options include cap or three-quarter length sleeves, braid trim and eyelets with cord lacing. Butterick 4702. Misses'/Misses' Petite Dress in size 14. Dress, lower calf, has dropped shoulders, shoulder pads, loose-fitting, dropped waist bodice, forward shoulder seams, mock front band, slightly flared, pleated skirt and above elbow sleeves with bands or long sleeves. You get all of the pattern pieces & instructions & a picture of the front & back of the original envelope. WE DO NOT WANT TO ADD TO THE LANDFILLS SO WE ARE CLEARING THEM OUT AT ROCK BOTTOM PRICES! A 'Marlo's Corner' Pattern. Pullover dress or top has zipper in front opening. Pants have elastic in waistline casing. Waist: 26" - 28". Sizes: 10-12-14 . Envelope good; minimal age. 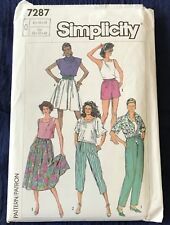 Simplicity 9161 Christie Brinkley Collection. Bodice sized for stretch knits only. Size AA P-L. In six-strand cotton embroidery floss. These designs are suitable for guest. Circa 1976. 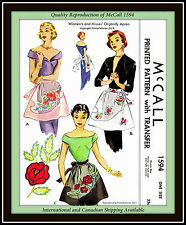 "This envelope contains transfers for 12 different designs embroidered. for stamping and embroidering the designs. Includes iron on transfers. Listed as used but this item has never been opened until I took pictures. See photos for more information. Simplicity 2431 Daisy Kingdom Child's Dress, Top, Capri Pants and Bag. Complete 18 piece uncut pattern with instructions. Simplicity 2348 Daisy Kingdom Child's Dress Jacket and Bag. Size BB 5 6 7 8. Complete 24 piece uncut pattern with instructions. Complete 9 piece uncut pattern with instructions. Short dress V. 1 and 2, or long dress V. 3 and 4 with skirt gathered to bodice at normal. V. 1 and 2 have lace or eyelet trim. Vintage Vogue 1970s sewing pattern 8298 velour knit crepe jumpsuit dress 31.5 "
Fabrics can be knits or non knits (see photos for complete back of envelope details). Cut on one of the shorter lengths with longer pieces included. Tissues in good condition. Envelope very yellowed but intact. 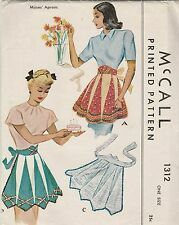 1948 McCalls skirt sewing pattern 7237 26 waist All pieces and sewing instructions in envelope. Easy to sew mix 5 version top.perfect for spring. Size LG-XL-XXL, 16-26, bust 38"-48". NEVER a handling fee! Each top has a subtle style detail that sets it apart. Semi-fitted overblouse has a scoop neckline or shaped collar with hook and eye or zipper closure. Simplicity 4434 Size 16 Bust 34 Waist 28 Hip 37. This Simplicty 6280 pattern can be used to make hip-hugger shorts or bell-bottom pants or a top in two lengths. It's from the "How to Sew Pattern" line and has been used but appears to be complete. Please examine photos closely for condition issues. Thank you for shopping! Burda 9652. I'm not very familiar with Burda patterns, but feel free to ask. and an above waist yoke. Baby Toddler. EUR: 68-74-80-86-92-98. Three variations of overalls have snap shoulders. Sewing Pattern. A 'Designer Fashion' pattern for pants and skirt with back zipper and waistband. Top, with front gathered to front bands and yoke, has collar, optional pockets concealed in side seams and long sleeves.